The incredible Chef Raymond Blanc is finally back in Singapore! Catch him at this year’s World Gourmet Summit to see him in action. Before that, check out our interview with him to find out his recipe for success, his favourite meal, and his ultimate guilty pleasure. It’s been more than a decade since you were last in Singapore to be a part of the World Gourmet Summit 2018. What brings you back, and what do you look forward to the most? True, it’s been over a decade that I was last at The World Gourmet Summit. Actually, I was the first chef to launch it with the wonderful Peter Knipp (former Group Executive Head Chef at Raffles and now the organiser of the WGS & Peter Knipp Holdings). What brings me back officially to The World Gourmet Summit is the opportunity to cook and show some of my latest dishes from Belmond Le Manoir aux Quat’Saisons to a select audience. I’ll also create a wonderful evening of food, friendship, and art de vivre. On a more personal note, I have been back a number of times to Singapore and other countries in South East Asia for leisure, such as visiting friends and for a holiday to enjoy this beautiful part of the world. I love the food scene in Singapore so I look forward to visiting many of the Singaporean hawker foods. My first encounter with street food in South East Asia was in Singapore, which is why I have a fondness for them. Some of the places I visit are Senoko fishery, Tekka Wet Market, and Geylang Serai Wet Market. I also long to revisit the Singapore Botanic Gardens where I cooked last summer with my partners Kenwood and created an extraordinary moment for the gardeners. As I love gardens, the National Orchid garden will also be on my list. If I have enough time I would love to visit the cloud forest! Having said that, I would love to see China Town too. Behind every successful restaurant is a team working together and producing great food. What do you think is the best way to motivate a team? First, you need to have a very powerful vision and philosophy, not only on the expression of your own food but also how and where the food will be served which will define the ambience of the restaurant. Mine is based on seasonality, the nobility, freshness of the produce, and to teach young chefs the importance of provenance as well as management of waste. This vision should be supported by strong training, an induction program, reviews and appraisals. At all times, budding chefs should be supported, nurtured, and guided so they gain confidence, both in their craft and their personality. I have trained around 40 Michelin-starred chefs. Here at Belmond Le Manoir aux Quat’Saisons, we are a school of thought. Throughout the course of your career, do you think that the culinary world has evolved? How different is it now as compared to before when you were a budding chef yourself? All businesses – whether it is technology, fashion, or hospitality – will always change and evolve. It will change according to what the modern consumer wants. I strongly believe that today’s modern guest is knowledgeable, well-travelled, and embraces responsible luxury. Great leaders are always reinventing their cuisine: Marie-Antoine Carême; then Vincent La Chapelle; then Auguste Escoffier; after him was Michel Guérard who catapulted nouvelle cuisine; followed by Feran Adriá who took the mantle of gastronomy through the medium of molecular gastronomy. Then there was a big bang of fusion cuisine which was a complete mix of cultures and was misunderstood. Now, I think it is the most interesting development of cuisine. It is driven by modernity, the provenance of the produce, and bags of creativity. Today, there are now so many extraordinary young chefs who are driven by their expression from both their local values and from across the world – it really is an exciting moment. Take London for example, where it now has more than 350 languages and dialects. The mosaic of these different cuisines is just as complex. Thinking smarter, being creative; it’s something many people struggle with. What advice would you give them in order to achieve that? The advice that I would give to any young person is to first embrace your own culture, learn it, nurture it, and develop it. At all times be curious, open your mind, your eyes, your heart, your intuition. Then, you can enrich your own culture with other peoples’ culture. My cuisine is very much an expression of that. As a Frenchman, I know who I am. But I also have enriched my own culture through my travels around the world where I introduced new tastes, new textures, and new techniques which have enriched me without confusing my own identity. This means you will see a lot of nuances of flavours weaved into my creations, especially South East Asian. What’s the one quality that you think a chef should have in order to succeed? Talent and passion alone will never be enough to bring you success. There are a number of qualities that are key; strong work ethics, the constant reappraisal of your own work, total curiosity, openness to new ideas, and working as a team. How do you come up with new recipes? Do you prefer to start with the basics or do you improvise? Often ideas are intuitive rather than starting with the basics. For example, morels are in season and a beautiful little dish of the first morels with the first tender spring vegetables will be the base of a new dish. Singapore has long been a very strong influence in my creativity and I use many of your spices and herbs to create many dishes, including a crab and coconut or ravioli of exotic fruit which I will be serving at this year’s summit on Wednesday 25th April. What is your favourite home-cooked meal for the family? When I return to my home in France, my 95-year-old mum, the formidable Maman Blanc, knows exactly what I love. There will be crudités which are grated vegetables from the garden with different dressings; a beautiful plump, roasted farm chicken with its own juices; garlic sautéed potatoes; and of course, Comté cheese. To round up the meal is my all-time favourite île flottante, a dessert of soaked biscuits in kirsch syrup topped with vanilla cream, poached meringue, and threaded crackling caramel. What’s currently your most exciting new dish or ingredient and why? We are currently developing a number of dishes. The morels which I mentioned earlier is one that we’re excited about. We’re also working on a study of different cured cuts of salmon with different herbs which will provide a colourful, fresh, spring palette as well as different flavours. We are also revisiting my former café crème dessert to make it lighter. What’s the one ingredient and one kitchen tool you must have in your pantry? I am a Frenchman, so garlic of course! But I could easily think of another 60 ingredients such as the best extra virgin olive oil, French mustard, spices, dried pulses, and many more. What is one thing about you that no one knows about? I couldn’t possibly say! It would spoil it… but perhaps, something that people don’t usually know is that I have an honorary OBE, given by Her Majesty The Queen, from the French Government, the Legion d’Honneur, which is highest French order of merit. Essentially, I am a Knight without a white horse! It is very rare to be awarded both, but I’m a very privileged and grateful man… oh, and I love dark chocolate KitKats. Don’t tell too many people! 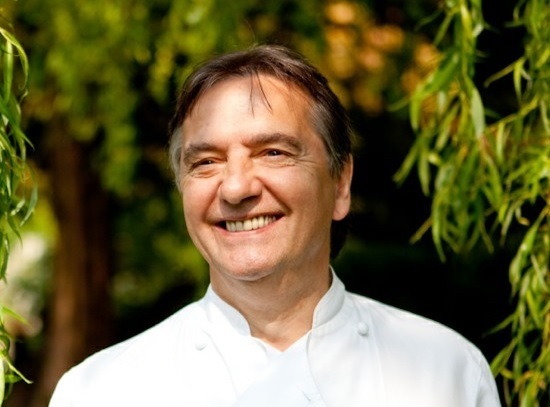 Get your tickets today to catch Chef Raymond Blanc as whips up a legendary lavish meal for diners at the Grand Hyatt. Don’t miss the chance to catch one of the world’s most respected chefs in action!